All of the meaningful data that exists currently demonstrates that the most positive outcomes for children as they grow through life are maximized by the involvement of both parents. Everyone needs to accept that children need active, ongoing relationships with both parents whether a marriage or partnership succeeds or fails. However, it’s extra critical that when a family is broken, those relationships are maintained absent provable, justifiable reasons for one to have their parenting time severely curtailed or eliminated. Shared parenting works. It provides for the best possible outcomes for growing children. Equal custody or close to it should be the norm and the priority in family courts everywhere. It is understandably difficult when a relationship has become irretrievably broken. It’s at least as hard for the children born of that relationship. Even though you and your partner have ended your relationship, their relationship with the children has not ended. It will, however, be different, and be tied to some child custody arrangement either court ordered or via a parenting time agreement between the parties. Despite the differences that you may have with your ex-spouse, you must recognize that the children deserve a relationship both with you and your ex-partner, and as equally as possible absent good reasons that go beyond the usual relationship disagreements. Child abuse, substance abuse – something serious would justify the minimizing or ending of a relationship between children and their parents. They also need to know that you will not love them any less for loving the other parent. Be encouraging and help to cultivate a positive relationship with the other parent. 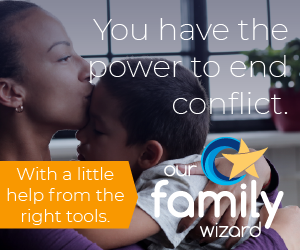 We completely understand how difficult an undertaking this can be, particularly if your relationship with the other parent remains high-conflict after everything has essentially been settled. Manage your emotions, your words, and even your facial expressions in the company of the children when the other parent is the subject matter. Smiling, nodding affirmatively, and using positive language when they are excitedly sharing a positive experience they had with the other parent. When you talk to them when they are with the other parent, use positive words and phrases, such as , “I look forward to seeing you next week!” instead of, “Awww, I miss you so much.” The former offers positive, exciting feelings. The latter, sad and depressive feelings. When you are aware of special plans that are forthcoming with the other parent, assist them in doing some research on their vacation or field trip and encourage excitement and anticipation. Be the one to verbalize a reminder to give the other parent a call because the kids are notoriously absentminded when it comes to situations like that. Just do it a single time during each custody period. That’s enough to plant that seed of cooperation. In each of the above scenarios, you’ve set aside your feelings about your ex-partner in your child custody situation. Instead, you’ve focused on generating excitement and positive feelings in the children about the other parent that they love. Remember, your children grow up. They realize and know more than they let on and their knowledge and memories increase as they get older. When you can create a system and habits whereby your are primarily positive and encouraging about the things that they do and the communications that they make with your ex-partner – you create the memory for them that you did go above and beyond to make their lives better. This happens regardless of most efforts of the other parent, even when they are less inclined to return the favor. We see this result all the time and many involved with mrcustodycoach.com have even experienced this despite widely varying child custody arrangements. Oh, and it goes almost without saying that family courts look favorably upon such actions, too! While the family court systems haven’t yet caught up to the statistical realities that are a result of two active, willing, loving parents in children’s lives – things are changing slowly for the positive. More legislation is being introduced and some of it is becoming law – rebuttable presumption of equal custody (shared parenting) is making inroads. Keep doing the right things for your children and maybe someday we’ll see broader child custody changes that will give children the active involvement with their parents that they need for the best possible chances of future success.